"This is no ordinary steel fencing post, this is Clipex"
Time is the most valuable resource we have; Clipex posts are guaranteed to give you more of it. Fencing can be erected in half and in some cases a third of the time of traditional fencing methods. 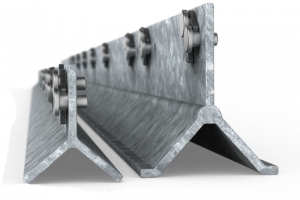 Clipex posts use a new, stronger strength to weight design. They are made with min. 450-grade high tensile steel, whilst keeping great elongation properties. All our Clipex posts feature a backing plate at ground level, to give the posts strength where it matters most. The flanges of the Clipex post provide a strong resistance to movement. The Beefy post has equal resistance to ground movement to that of a timber post. Beefys have a 60% greater surface area, providing 230% more strength than a standard Clipex post, they are made from thicker gauge steel and slightly longer length, all this makes for a very strong fence post. Clipex is so simple to understand, it does not require specialist tools or experienced tradesmen. Push the wire into the clip and it's attached, even children understand it, it's that simple. Clipex's unique aluminium clip saves hours stapling and requires less time bent down fixing bottom wires. The unique Clipex post design drives into almost any soil type with ease. All Eco, Standard and Beefy posts come with a ground level strengthening plate and below ground anti-lift plate. The anti-lift plate acts like a barbed hook anchor, which strengthens the fence over undulating ground and also once installed acts as a deterrent from opportunistic thieves. Security brackets can be retro fitted for additional security if required. Once the X™ fence® wire is clipped in place it is very difficult to release the tensioned fence. Security and peace of mind, once installed it is there to perform for a very long time. The lightweight yet high tensile strength of Clipex make's it a much more manageable product to handle and erect especially in challenging terrain. Combining Clipex posts with X™ fence® wire netting, enables posts to be spaced further apart without compromising the effectiveness or strength of the fence. This also reduces the need to purchase extra posts, which in turn reduces labour and machinery costs. Stainless steel pins and a aluminium clip make Clipex stronger than traditional staple fixing. The pins are riveted in with a 10 tonne press, so there are no fiddly parts to come loose or get lost. These simple clips eradicate the need for staples therefore providing a strong wire connection every time. The clip sits well inside the perimeter of the post, so there's no chance of them being damaged when using a post driver. Each post has an automated weld at the top to guarantee that the post won't split when being driven with pneumatic drivers into hard ground. All fences require maintenance in their life. Clipex fencing reduces this maintenance drastically. The Clipex fence solution retains the wire but does not restrict it, allowing the wire to take the strain. Should your wire need to be restrained it's a simple matter of un-clipping, straining and then re-clipping. You can easily replace any damaged sections of fence just as easily as when you installed them. Clipex post can also be used in an emergency quick fix or to bolster up failing fences. What goes up must come down! Eventually your fences will need to be replaced or pulled down. Hopefully that's a long time away, but when the time comes all the wires can be easily salvaged and rolled up, leaving the posts standing which can be used again or pulled up and used elsewhere. More importantly no need to reinstate 15 years later or sooner. Duty of care and security to both your staff and the public. We are confident you will save more than 50% on your current labour and machinery costs whilst also providing a more superior very low maintenance fence. Clipex systems offer a great alternative longer service life material than that of traditional timber products. The long term sustainability, including being able to be recycled at the end of its life, is a key factor for those bodies looking to source responsibly. Their use can also contribute towards reducing the overall carbon footprint of a project, when compared to other competing materials and life time costs: there is a lesser requirement for transporting payloads and fuel usage and heavy machinery as a result of the lightweight nature of the product. Not to mention a reduction in labour movement and involvement. Health and safety concerns are also significantly reduced due to the lightweight nature of the product itself and the ease with which it can be transported to the site. No leaching of any treatments or concerns of contaminating the soil or affecting contractors or the public. Due to the properties of Clipex it enables fewer workers and less machinery, thereby reducing the project managers and risk assessors concerns over managing increased staff, normally associated with larger project requirements when using alternative products. View an example of the time and labour saving Clipex can offer. Not just any ordinary steel post! Unlike traditional steel Y posts, Clipex posts have been developed with ground breaking manufacturing methods that allow the post to be made with even parallel flanges. This process guarantees a consistent gauge throughout, which gives a stronger strength to weight ratio. All Clipex posts have a strengthening ground level plate and below ground an anti lift device. The Clipex post profile and high tensile steel construction give these posts a degree of flex unlike timber posts. This prevents the fence line becoming loose over time with constant livestock pressure. The Clipex Beefy post is specifically designed to add ground holding and strength to your fence line, whilst providing the benefits of steel and the Clipex system. The profile differs slightly from the Standard and ECO posts as it has angled flanges. These give an increased surface area in the ground, as well as reducing any twisting. The flange profile also increases the lateral strength. We recommend their use in softer soils, high stock pressure areas, slight changes in a fence line or wherever you need to beef up the line. Designed to replace timber and concrete intermediate posts. Click to return to Clipex Information and Guides. Tractor and tractor mounted post knocker, tractor trailer. Days to erect total fence 3-4 days. Hand held pneumatic post driver or manual post driver, pickup and trailer. Days to erect total fence 1-2 days. Over 50% lighter and 75% less cubic space to deliver product and carry to site SAVING in both transport and labour. Using X™ fence® high tensile wire netting will offer you a real return on investment and a longer lasting low maintenance solution. Using the Clipex system makes installation easier with less ground disturbance from both machinery and the stake itself. Expensive labour costs and machinery hire are greatly reduced. Over a 30 year period over 50% cheaper. Taking into account reinstatement of timber fence. Traditional timber with a 15 year desired life. Clipex steel posts system in excess of 30 years.